How do archaeologists locate, conserve and recover historical treasures from old shipwrecks? What is erosion revealing on the foreshores of the River Thames? And how do you weld up an oil or gas pipeline one kilometre underwater? This week we're looking at the "appliance of science" beneath the waves as well as hearing how the ageing Voyager space probes have discovered the births of new stars in the Milky Way, how a gene therapy technique can block HIV infection and how a computer programme can spot to what extent a photo's been doctored. Plus, does heading a football cause brain damage? 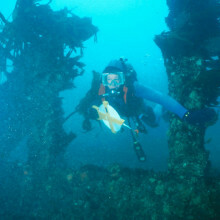 Shipwrecks are often described as underwater time capsules. They can give us a snapshot in time from the bygone years, glimpses into military life, trading relations between countries, social life, and construction techniques. And to discuss the archaeology of shipwrecks, we have with us an archaeologist with mask, fins, and spare snorkel: Dr. Dave Parham from Bournemouth University. Hello! So, I know you've been working on the Swash Channel Wreck. So tell us a bit about that. What's the history behind it? 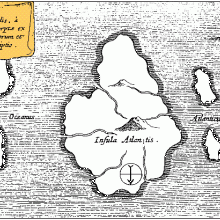 Dave - It’s an early 17th century – probably a Dutch-owned - merchantman that was wrecked outside Pearl Harbour and found about 10 years ago now. Diana - What sorts of problems are facing it when it’s in its current state? Dave - Well it’s been buried since it was wrecked sometime in the 1630s but gradually over the last 10 or 20 years, it started to become exposed. So the wreck itself and its contents have been preserved by being buried, but are now exposed to the elements and being rapidly degraded. Diana - So how has it become exposed? What processes have caused that to happen? Dave - It’s natural erosion. I think the seabed in the area was affected by Victorian coastal engineering which means that the sediment flow into the bay is less than it used to be and what was a large sand bank is gradually becoming smaller. Diana - I see. So, when you've got timbers and things that will decay naturally, then this becomes a very big problem. So what kind of methods can you use to conserve a wreck like that? Dave - It’s difficult when they're on the seabed because nature is taking the seabed away and it’s quite a hard thing to stop that. You can cover them. We’ve covered parts of the wreck in a sort of plastic matting and sandbags and covered it back up again and we also put more sand on it. But ultimately, if the whole seabed around it is reducing, you're on to a bit of a losing battle. Diana - And are sandbags the only methods you can use to shore ships like that up, or are there other things, other sorts of structural ways of solving the problem? Dave - You can use other methods to trap sediment on top of the wreck. You can buy sort of plastic sea grass that traps sand from the water column and allow it to fall onto the wreck is another way of doing it. But the simplest ways is sandbags and this sort of plastic matting which seems to work well. Diana - Okay, so that's the structural bit of the ship, but what about the stuff that's inside it? How do you conserve the bits and pieces that were wrecked with it? Dave - Again, it’s the same thing. As long as you can keep the sediment on top of the wreck, then the material that's contained within the sediment will be alright as long as it’s not exposed. So it’s all about trying to keep the seabed as it was, trying to maintain it in one place. Diana - I see. And then how do you decide what you're going to leave down there and what you're going to raise to the surface? Dave - We made a decision - along with English Heritage who manage the site - that we would leave everything on the seabed that we thought we could maintain there, which is about 80% of the site, and then remove what is in fact the bow of the wreck, which actually juts out into a shipping channel. We're removing that because we didn’t think that we could have a chance of saving that. So it was a pragmatic decision really and that we would save and leave everything on the seabed that we could and only remove the stuff that we didn’t think stood any chance of surviving. Diana - I see, and what kind of bits have you removed so far? Dave - We excavated the bow of the wreck. It’s the bow that's the most endangered so we uncovered that and we excavated the contents of that so we’ve uncovered the structure and we’ve been gradually taking that structure apart so that allow us to raise it as individual timbers rather than a big object. Diana - Okay and then how did you go about actually raising it and how deep is this buried underwater? With kind of problems did you face? Dave - It’s not very deep. It’s only in about 7 meters of water; but it’s on the exposed location; it’s exposed to prevailing winds and it’s also within a shipping channel that has significant tidal movements. Our biggest problems are natural. A combination of wind and tide mean that we can only dive on the site a few weeks each month which makes it difficult to plan anything too far ahead and so there is a natural problem for us. Diana - And what are the bits of machinery that you used to lift this stuff up from the sea? Do you use airbags? Do you lift it all by hand? Dave - No, it’s all been quite simple. The majority of material is being lifted by hand. The large ship’s timbers, we’ve placed those on a steel frame that is raised onto a crane barge. Diana - And once you've got it all out of the water then what happens? Does it all get taken apart and taken to the museum and then reconstructed? Dave - All the material that have come up is going to be analysed and studied. The structure itself is going to be recorded completely and we’re hoping to raise the money to conserve the structure and then place that on display in Poole museum. Diana - I see and what's going to come up next? Dave - Next will be the bow of the wreck. We took that apart in the summer and we’ve been planning to raise it now for almost 6 weeks but we’ve been hampered by the weather conditions – all these gales and rain that we have mean that we can't dive. So we’re currently waiting on the weather. Diana - The windsurfers will like it though! Moving on to a slightly different subject, I mean, what is the most striking thing that you've seen on a wreck apart from this one? Dave - The most striking thing I've seen on the wreck are actually some of the materials from this site because we’ve got carvings on the wreck, we’ve got the early ship’s carvings in the United Kingdom and quite a striking sight. We’ve got two carvings of mermen, fish's tail and a man’s head. One very large carving of a male head, which is on the head of the rudder, and we’ve got a couple of much smaller carvings of sort of gargoyles, which are from around the gun ports on the wreck. So this is all decoration that was on there originally but it is very striking to look at and very unusual for it to survive. Diana - Well, fantastic! But why would they have carvings like that on a merchant ship? Dave - It’s a status indicator I think. This is owned by an organisation; it’s trying to make a point, somebody that is demonstrating that they are something above and beyond the rest of their competitors. It’s a very large merchant ship for its time and this is all about demonstrating to your competitors, and people around you, that you're somebody worth trading with. Diana - And can anyone see these carvings yet? Dave - They're currently being conserved but we’re hoping to have some of them available for public display in Poole museum next year. Diana - Fantastic! Well thank you very much. That was Dave Parnham from University of Bournemouth. 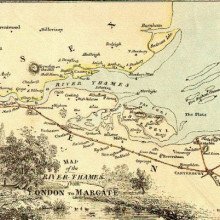 Elliot - The Thames Discovery Programme is a successor to an organisation called the Thames Archaeological Survey who, 10 to 15 years ago, undertook a large scale survey of the intertidal zone in the River Thames looking for archaeological features and deposits. We looked at their records and identified what we call 20 key sites and we’ve gone down and recorded and monitored them with over 300 members of the public, and identified areas which are at threat, where features may be eroding away and then we’ll come in and record anything that is liable to get washed away by the river. Meera - And so, we’re at one of the 20 identified sites now. So we’re in Greenwich, just along the shores of the Thames here and behind us is the University of Greenwich, which has quite a long history in its own right. Elliot - Well yes, it’s a world heritage site. I mean, these magnificent baroque buildings were originally built as a hospital for injured and ailing seamen, not for princes or kings! Before the hospital, there was an earlier palace at the Palace of Placentia, built in 15th century, which was the birthplace of Henry VIII, Queen Mary, Queen Elizabeth; the Tudors liked it very much! And what we’re starting to find out on the foreshore are a lot of features which relate to the earlier medieval structure. Meera - Well it’s quite busy down here on the shores. So we’ve got a band rehearsal taking place behind us and then there are many of the Thames clippers going past and we’re really in the middle of London, but yet, you've got all of these archaeological finds, just here on the shores. Elliot - It’s quite a odd! 10 or 15 years ago when the Thames Archaeological Survey came down, they recorded structures which are now gone and a lot of the stuff we’re seeing today wasn’t there 10 or 15 years ago. It was covered up and slowly – as the foreshore drops around it - it’s starting to poke up. One of the things we can see here is a whole load of rectangular semi-halved timber piles driven into the foreshore, and this looks very much like a jetty structure, coming off the river wall, but this would pre-date the current building. So this is probably a later, medieval jetty. Meera - So you’ve got this small lamp of timber – so what? Going quite a fair distance, a good few metres in front of us there, just in parallel to each other. Elliot - Yeah, so they're in parallel lines which suggests they're a coherent structure. As you say it’s about probably 5 metres along the foreshore. So we’re looking at a reasonably substantial late medieval or Tudor jetty, which probably would’ve led to the palace. Meera - But just moving a couple of meters down towards the river now, there's a big long plank really of a few metres in length which I have to admit, I wouldn’t possibly notice, but now that I'm here with you and I'm staring at the ground, it’s quite obvious. Elliot - Yeah, it’s not quite a plank. It’s what we call a base plate. You can see there are these rectangular mortises cut into it with large rectangular tenons, driven through to hold it in place and you can just see two arms coming backwards up the foreshore to form a sort of horseshoe or U-shape. And if we turn around, we can see it’s directly in line with what we think is our late medieval or Tudor jetty. But this sort of construction uses a completely different technique. This sort of technique we think dates to the 12th century so I would suggest this is a similar access point from the 12th century, through into the late medieval into the Tudor period. We do know that Greenwich was a royal manor from the 10th century onwards, so it’s clearly a place where there's going to be a bit of investment and a bit of traffic coming up and down, and up from the river. Meera - But interestingly, moving even further towards the shore now, and basically on it, there are some solid structures - almost solid lumps - there which are also jetties from an earlier age. Elliot - Well not for certain. We can walk down and have a look. You'll also notice there's a huge socking anchor chain there which is a mooring point for ships and we know that's 20th century. And we’ve known about these large rectangular timber piles for sometime but we assume that it had something to do with the anchor chain and were thus modern. But now we’ve got these other structures which have eroded out, you can see they're directly in line with them. So given the massive engineering of these things, the only other people who do that are Romans; and given that we’ve got medieval jetty, and further down we’ve got a 12th century jetty, and further down here, we’ve got these massive rectangular piles and I think what we might be looking at is a Roman jetty down here. They make a lot more sense as a Roman structure than as a modern one. Meera - So essentially here, you've got a tale of this jetty over time. So a jetty – you know, people needed them to get access down into the water - and people throughout time have just built from that original Roman structure. Elliot - Well, yeah. I mean, you've got to remember up until the coming of the railways. The river is your easiest and cheapest form of transport. Here, we seem to have an access point through time. We know there's a Roman religious complex upon the hill in Greenwich Park. So that may have been where it kicked off and people have just kept using the access point. Meera - And is it quite difficult – I mean looking at these structures, I can't really tell too much of this story. It’s quite hard piecing this all together to get the result you've come up with. Elliot - Well it takes awhile, looking at the techniques they're using to shape the wood, how they're using it; but also, we know sea levels have been broadly rising for 14 – 16,000 years. So it’s quite interesting we’ve got what we think is our earliest structure right down at the bottom of the low tide zone and then we go up through the 12th century, into the late medieval period as the river levels rise throughout this period. Meera - And interestingly, we’re here at mid-day really and it’s all just really visible now. So, you know when the tide comes in, you just can't see it. Elliot - Oh yeah, it’ll be all covered up. It will be – where we’re standing, there will be about 2 metres of water above our heads. Meera - Good thing we came now then! Elliot - Just a little! Meera - So there's really quite a wide range of things, just on this one site. So this, combined with the other 19 or so you have, you must be really getting a good insight into the history of London and its uses of the Thames. Lyman-alpha emission is an ultraviolet radiation generated when an electron moves between the first and second energy levels of hydrogen, and it is thought to be an indicator of regions where star formation has occurred. But in order to look at Lyman-alpha radiation you have to move far away from the clouds of hydrogen gas that are present in our solar system. It is these hydrogen particles (called a heliospheric hydrogen glow) which can also scatter and disrupt Lyman-alpha radiation just as city lights can interfere with your view of the stars. Both Voyagers have now travelled far enough away from the sun to look back and see through this hydrogen glow. 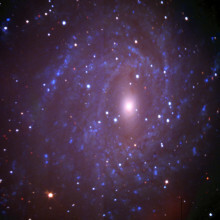 Previously Lyman-alpha emission has only been predicted with equations but, writing in the journal Science, Rosine Lallement and colleagues from The University of Paris Diderot can confirm that this emission has been detected and that it does have its origin in the regions surrounding newborn stars. We can therefore use this information and look at other galaxies, as well as the Milky Way, in order to understand where a star formed. Sadly, Voyager 2's spectrometer has had to be switched off to conserve power, and the spectrometer on Voyager 1 will probably be turned off soon, too. This means that those spacecraft will not be able to collect much more data on Lyman-alpha sources. It may be that the New Horizons Spacecraft (due to arrive at Pluto in 2015) can complete the data collection and look at the emission from other galaxies. A modified virus encoding an anti-AIDS antibody can protect animals from HIV infection. 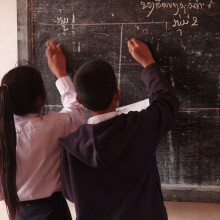 An estimated 7000 new cases of HIV occur each day, the majority of them in developing countries where access to heathcare and antiretroviral drugs is limited. For this reason, a vaccine is urgently needed to control the spread of the infection. Previous vaccine strategies have performed poorly, barely making a dent in infection rates, and so far the only intervention with proven longterm efficacy has been circumcision, which reduces a man's risk of acquiring the disease by 60-80%. But a paper published this week in Nature by Caltech scientist David Baltimore and his colleagues might hint at a new way to combat the problem. They've used a self-complementary adeno-associated virus 8 (scAAV-8) as a vector, to ferry into experimental animals the DNA code for an antibody called b-12, which has HIV-neutralising properties. 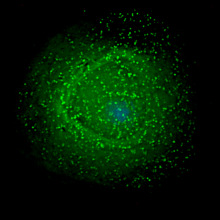 This antibody, discovered some years ago, is special because it has the capacity to disable many different strains of HIV and can prevent infection becoming established in the first place. The Caltech team injected 100 billion particles of the scAAV-8 vector into the leg muscles of experimental mice. These animals had also been modified to carry in their bloodstreams the human CD4 white cells targeted by HIV. Within a week, high levels of the human b-12 antibody were detectable in the blood of the mice and expression was sustained for at least one year, which was the duration of the experiment. The researchers then challenged the animals with an injection of HIV sufficiently large to infect the vast majority of unvaccinated mice and tracked the numbers of CD4 cells circulating in the bloodstream. Compared with control mice, in which the CD4 count dropped nearly to zero, the b-12 antibody-producing animals showed complete protection against the infection. The result is stunning, but not without a few residual wrinkles that need ironing out. This is a study in mice and so the concept would need to be proven in humans. Also, the long-term tolerability and safety of sc-AAV vectors and the effect of sustained high-level expression of the b-12 antibody are unknown, and it's unclear how much of the viral vector would be required to protect larger species including humans. However, according to the team, who dub their technique "VIP" - vectored immunoprophylaxis - "given the level of protection that VIP has demonstrated in vivo, we believe that highly effective prophylaxis through expression of existing monoclonal antibodies against HIV in humans is achievable." This week, researchers from the UK, Canada and Singapore have accomplished quantum entanglement on the macro scale, entangling two millimeter-sized diamonds. Typically we think of objects moving and interacting according to classical mechanics - i.e. 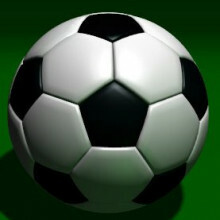 Newton's Second Law - you apply a force to one object and it will cause it to accelerate in a particular direction. But in quantum mechanics there are extra complications, such as entanglement, where an action performed on one object will affect another - even if they are at a distance: something described by Einstein as 'spooky'. Studying these quantum effects on objects any larger than an atomic particle is tough because there is so much environmental noise. Once in the 'macroscopic' scale, there are too many extra factors which are difficult to eliminate. The usual approach is to lower the temperature and so reduce thermal noise. Publishing in the journal Science, a team led by Ian Walmsley of Oxford University, took millimetre-wide pieces of diamond and tried to look at them in a more typical environment with an ambient temperature. To get around the problem of other noisy interactions that could interfere with results, they shortened the experiment to a matter of femtoseconds, and they did this using laser pulses. Next came the entanglement, which they achieved by setting up a beam-splitter and detectors. They fired two laser pulses at each diamond, 350 femtoseconds apart. The second pulse picked up the energy the first pulse left behind before reaching the detector as an especially-energetic photon. If the system were classical, the second photon should pick up extra energy only half the time - only if it happened to hit the diamond where the energy was deposited in the first place. 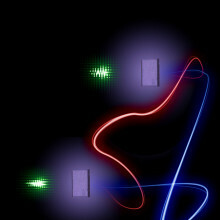 But in 200 trillion trials, the team found that the second photon picked up extra energy every time. That means the energy was not contained within each diamond, but that they shared the same state as if they were one system. It had already been predicted that this could be done with larger objects at ambient temperature, but actually doing it is something else altogether so - although brief - this may be a step towards some real-world quantum computing, where entanglement allows you to store far more complex information than binary digits. A signal that controls the integrity of the blood brain barrier - the system that protects and chemically cocoons the brain from the rest of the body - has been discovered. Early during embryonic development, the cells that line the blood vessels supplying the brain and spinal cord become tightly linked together, establishing a barrier that encloses the central nervous system and permits only certain things to pass through. Others, including immune cells, antibodies, chemicals and many pathogens are screened out. But what controls the formation and operation of the blood brain barrier wasn't known. Now a team of scientists from Canada have cracked the problem and discovered the molecular key that locks and unlocks the barrier. It all hinges, Alexandre Prat and his colleagues have shown, on a signal called sonic hedgehog. 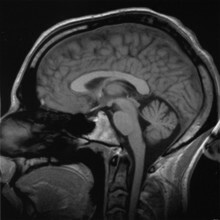 This is produced by brain cells called astrocytes, which are in contact with the endothelial cells in the blood vessels. Writing in Science, the team show that, in the presence of sonic hedgehog, endothelial cells bind tightly together, immune cells and proteins are unable to escape from the cerebral circulation and the linings of the blood vessels express fewer cell adhesion molecules making it harder for inflammatory cells to cling on. Applying a drug called cyclopamine, however, which blocks the action of sonic hedgehog, reversed all these effects. The drug also drammatically worsened the conditions of experimental animals with a multiple sclerosis (MS)-like disease caused by entry into the nervous system of white blood cells that attack the myelin sheath that surrounds nerve fibres. Reducing the integrity of the blood brain barrier appeared to enable more inflammatory cells to flock into the nervous system, amplifying the damage. In line with this observation, brain samples tested from humans cases of MS show increased levels of sonic hedgehog production in areas where the disease was most active, suggesting that the brain upregulates the signal in an attempt to dampen inflammation. Together, say the researchers, these data "provide compelling evidence suggesting a dual protective role for the hedgehog pathway at the level of the blood brain barrier and by acting as an endogenous anti-inflammatory system." Moreover, these findings open up new therapeutic avenues that could be exploited to control entry of immune cells into the central nervous system and therefore reduce the rates of recurrence of MS attacks. Hany - We were motivated by legislation in the UK that was considering mandating that altered or retouched photos be labelled as such and that of course was in response to the body of literature that is linking eating disorders, body dissatisfaction with the overexposure to extremely retouched photos. One of the criticisms of that legislation was that publishers were arguing that a simple label saying this has been retouched would not, in fact, distinguish between very simple types of manipulations like colour correction and cropping, and the more extreme forms of photo retouching. And we wanted to create the ability to distinguish between those types of manipulations. Chris - So there would be almost like a sort of "Richter" scale of the degree of photo manipulation which the law could require people who publish photos to publish with the photo but because it’s an industry standard, everyone’s on an even footing and it would enable people to make a value judgement as to whether that picture is faithful to reality or not. Hany - That's exactly right. So it’s a scale of 1 to 5. One means the image is largely unchanged from the original photograph and 5 means there's been a radical shift in the underlying appearance of the person. And I’ll also add - in addition to being useful in a legislative sense - it can also be also be used in a voluntary sense. I mean, photo retouchers often just – it gets away from them. They do one little tuck here and a little nip there, and pretty soon you're looking at a Barbie doll. And so, the ability to, in real time, get feedback to what your manipulations are doing we think would also be very useful for the photo retoucher. Chris - So how did you actually approach this? How did you go about writing a computer programme that would generate an objective readout of how the pictures were different but which and this is the real rub – would be meaningful to a human eye? Hany - That's exactly what the rub is. So we, as mathematicians and computer Photo manipulation scientists know how to model computer alterations, but how do we predict or model how a person would perceive changes? So there were two basic stages. The first stage was the mathematics. How do we mathematically model the alterations to a photograph and that includes geometric changes - things that alter the shape of the body, the length of the neck, the width of the hips and so on - and photometric changes - things that change the skin tone, the wrinkles, the colour. And those are the types of manipulations that we know photo retouchers do, and after about a year of effort we found a way to mathematically model all of that. Now of course that mathematical model is not exactly what we want, so the second stage was to collect many, many images of the original and retouched and asked human observers to rate them on a scale of 1 to 5 and for that, we used a crowd sourcing tool where we were able to collect data from hundreds and hundreds of people from around the world. And then the magic was linking up the mathematical measurements with the human measurements and for that, we use some very nice statistical machine learning tools that allow you to learn a mapping between a bunch of numbers, which are the mathematical measurements, and how people perceive; and as it turned out, although it didn’t have to be this way, but they correlated extremely well with each other. Chris - So, the people give their impression, the computer gives its impression and you can use the people’s impression to validate the computer model, so you know that your computer is returning a value which is meaningful not just to another computer, but is the way that a person would perceive the changes to that picture. Hany - That's exactly right and if the mathematical model was not properly constructed, that may not have been true. I mean, there are plenty of mathematical models that have nothing to do with human perceptions. So the magic was, how do you develop the mathematical model in a way that you have at least a chance of doing that modelling. Chris - And Hany, the idea would be that you could apply your model across the globe and say to people, “Right, if you're going to do some photo retouching, you have to subject it to analysis by our system.” But, say I was a nifty artist, are we not going to see a game of sort of graphical cat and mouse here where people will begin to manipulate photos in a way that actually can fool your algorithm in just the same way that people make web pages that fool Google’s algorithm? Hany - Absolutely, this is a cat and mouse game and I equated to the same of the spam, anti-spam and the virus and the anti-virus and the search internet. And there is a game, and people will try to game the system, and that does mean that the technology will have to evolve to play that game. I think the most powerful use of the technology is at the voluntary basis as I've said. I do think that photo retouchers sometimes just get a little carried away without knowing it and I think even just that amount of information will be very useful. But obviously in the legislative sense, there is going to be a game here and we’re going to have to play that game like we would in any other field. Chris - Terrific! We’ll have to leave it there but thank you for joining us to explain how it works. That was Hani Farid from the Computer Science Department of Dartmouth College. with Andrew Tobin, University of Leicester; Michael Lipton, Einstein school of Medicine; Thomas Bugnyar, Max Planck School of Ornithology. Hannah - A lot of research has been done on puffins and a lot less has been done on something like the European shag because people see it everywhere and don't think it's a really fascinating sea bird. But actually, we've learnt a lot using the European shag system! On the Isle of May we've been looking at them for about 30 or 40 years now, so we've got a lot of data behind us that we can use to answer a lot of questions. Sue - And what questions are you particularly posing? Hannah - Well, the thing we’re looking at the moment is because a lot of the work that we've done on the Isle of May has been during the breeding season, which is when they're breeding, obviously, but what we don't really know is what's happening to them over the winter period. This is half the year for birds, so it's ridiculous we're not really paying attention to what's going on over this time. Sue - Is that because they disappear or because they stay there and keep out of sight? Hannah - Well for European shags, for the Isle of May population, what we think they're doing is that a proportion of the population are staying on the Isle of May over the winter and the rest of them are travelling up and down the coast, up to 200, 300, 400 kilometres away from the Isle of May and staying the winter in different locations. And what we're really trying to do is find out why they're making that journey and what kind of effect it has on them. Sue - How do you do that then? Do you ring them? Hannah - Yes! All the shags on the Isle of May are actually colour ringed. They have plastic rings on their legs that have a three letter code on them and are brightly coloured. And this is basically what we're looking for using the telescope is that we can read the code from distance, we don't have to recapture them, and it means that over the winter we can try and find them and see where individuals are and then relate that back to what we see on the island. Sue - I know this research project is ongoing but what have you found so far, any surprises? Hannah - I think the surprise is just the sheer distances that some of these birds are going. Also we're looking if there's any kind of segregation within the populations so, for example, partners might be moving together or offspring are moving together, and we're not really sure if that's happening at the moment yet, but we have had some anecdotes of partners being seen courting in different locations and juveniles from a single nest having stayed together, so these are the interesting things we can be looking at in the future. Sue - Do populations of European Shags tend to stay stable? Hannah - Shags are actually quite an interesting sea bird because they seem to follow a what we call a 'boom and bust' dynamic; they bred quite fast for long-lived birds, but they can also have really high mortality rates. So over the winter in particular, we can lose huge numbers of the population in what is called winter wrecks; and in and around 1993-94 we actually lost about 90% of the Isle of May population in a really bad winter. Hannah - The winters are harsh all the way along the east coast and we don't see so much of a kind of boom and bust effect on the west coast - we think because there are more inlets on the west coast and they can be more sheltered. So shags are really interesting in that - for a sea bird - and they're diving sea birds, they go for fish - they're actually not waterproof. Sue - A bird that isn't waterproof? Hannah - I know that's one of those things that sounds like a really terrible idea, but in fact they drive really deeply for birds that just go from the surface and dive down; they can get down to about 40 metres and the thought is that this kind of lack of waterproofing enables them to dive deeper, but what it does mean is that they're very restricted to being able to come back to land to roost - because they need to be able to dry out their feathers - and on this unsheltered eastern shores we think if we're having bad winters what's happening is that they just can't dry out sufficiently and that they might be losing them through hypothermia or really high costs of trying to keep themselves warm. Sue - What use will this information be, apart from the fact that you might be able to apply it to other populations of European shags in Wales and Cornwall and other areas where it's quite rocky and cliffy where they like to be? Hannah - Because it's such a long data set we've got on this population and we know the individuals, we're in quite a unique position to be able to look at things like, something we call a 'carry over' effect, which is the effect that perhaps staying in a particular location has on the breeding success in the future season and that's not something many people have been able to look at; but also from a shag perspective if we know key locations where they are more protected, where they are surviving better over the winter. So that's something that perhaps in the future we might be able to protect for them. So from a conservation prospective it could have applied relevance. Diana - Hannah Grist from the University of Aberdeen. Welding up a metal pipe doesn’t sound terribly tricky but what about when it’s 1 km underwater? Well engineer Neil Woodward, who’s working with scientists at Cranfield University, is doing just that and he’s also set to set a record in the process! I suppose Neil that these pipelines are for oil and gas? Neil - Yes, that's right. Oil and gas pipes at varying depths, and there are some at 1km water depth in the North Sea. Chris - Are these the major conduit through which we recover the output from platforms out in the North Sea, for example, and then bring it ashore? Neil - Yes, that's right. Transport pipelines that bring it from the oil fields back ashore. Chris - And how extensive is that network then? Neil - Well there's a massive network of pipes in the North Sea and in the Baltic Sea, all at varying depths and pipelines of various sizes, up to 4 and 5 feet in diameter. 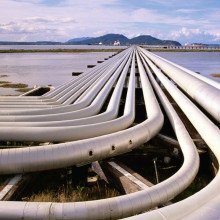 Chris - So, up until now, if someone had a problem with one of those pipelines, what would they have to do about it? Is it just a complete decommission job and re-lay a new one? Neil - It depends on the depth. 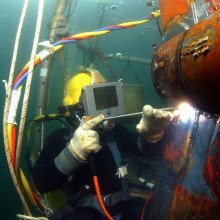 At the moment, if a pipe lies in up to 180 metres of seawater, there are techniques with divers where we can do a repair on a pipeline up to 180 metres seawater. There's techniques that we can use to repair that pipeline and this also depends on the diameter. For smaller pipelines, we can use mechanical connectors. If it’s a large pipeline and it’s beyond 180 metres of seawater then we have an issue with the current methods with divers, and then that's when we have to look at fully remote techniques, which is what I've been working on for the last 9 years. Chris - And what is a large pipeline as opposed to a small one? Neil - At the moment, we’re kind of cutting off at 30 inches, so between a pipeline diameter beyond 30 inches and up to 48 inches in diameter is where we are looking at welding those pipes subsea. Chris - Gosh! And what would be the sort of pressures and flow rates of the material inside those pipelines? WeldingNeil - For pressure tests, it can be up to 200 bar. The main issue is that they are at depths beyond diver reaches. We’re looking at being able to repair those pipes with dry hyperbaric welding, which is where we take equipment down and enclose it around the pipe, expel all the seawater inside that chamber and then weld it in the dry. Chris - Okay, so this isn't – when we say welding underwater - this is not having some kind of lance that can operate in seawater. This is actually establishing a complete dry environment around say, a damaged site on the pipe or something. Neil - Yes, that's right. It’s dry hyperbaric welding, which we know we can do in the lab. In the lab, we’ve used techniques to simulate that pressurised environment and we’ve simulated pressures up to 2 ½ km water depths in the lab. We’ve done that over the last 10 years, so we know we can do it in the lab, but the main issue is proving that we can do it offshore in a real subsea environment with subsea equipment which has been designed and built. Chris - So how does it actually work then? 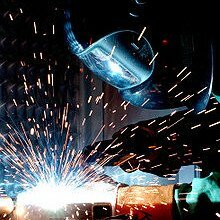 What do you assemble around the pipe in order to achieve that isolated segment that's the one you want to weld? Neil - At the moment, it’s specially-designed equipment. It’s equipment that's lowered onto the seabed. It’s effectively almost like a robot, a highly mechanised system which uses a number of electrical and hydraulic systems to be able to close around the pipe and for us to expel all the water inside, make it warm, make it dry - so we dehumidify the environment inside it - fill it with argon, so that we can start welding. Chris - And how does your machine know where to weld? In other words, if you've got a split or a junction in a pipe, how does it identify the two edges and then put a weld across it, and then how does it assess the integrity of that weld? Neil - We do have a vision system so we have camera systems that we’ve developed and with regards to integrity, what we’ve been doing is aiming for robustness in the lab so that we know that when we’re welding, we’re monitoring the welding electrically so that we know what a good weld looks like - the trace of a good weld - and we know what a bad weld looks like as we’re welding both visually and electrically. Chris - I suppose though that the only way to test it is actually to repressurise the pipe with what was in it before. So, this is quite an important question because if you get it wrong, then it’s just going to rupture. Neil - Yes, that's right. There have been issues in the past. At the moment what we’ve done is field trials, so we’ve welded at 280 metres and 350 metres of seawater - for a different application for remote hot tapping application that we should also talk about - and also for a repair application which we welded at 370 metres seawater and 940 metres seawater. We recovered those welds to the surface and tested those welds. Chris - And when you say this hot tapping process, this is where you would have a pipeline that's operating and you want to splice off some of that supply to take it somewhere else? Neil - Yes, that's right. There are applications where it’s beneficial to be able to make a field to flow in a different way. So, it’s an existing infrastructure, perhaps a large pipeline that's already been laid. It may have been down there for 20 or 30 years and it’s actually economically beneficial to tap into that pipeline and take out a small branch pipeline to change the flow characteristics in that field. It’s called ‘hot tapping’ because you're actually tapping into that pipeline while the product is still flowing. So the field is not shut down whilst you cut into that pipeline. And we weld inside the connector that goes on to the existing pipeline. Chris - If you'd have this technology functional when BP had its problem in the Gulf of Mexico last year, would this have made a difference to the outcome of that situation? Chris - That's Neil Woodward from Isotek Oil and Gas Ltd., and he’s working at Cranfield University. 50:34 - Is it OK to explore ships wrecked during the war time? 51:37 - How do you prevent fires when welding oil pipelines? Neil - For the repair application, yes, we use a fully inert atmosphere. There wouldn’t be any product in the pipeline for repair application and potentially, there’d be plugs inside the pipe to make sure there's no risk. For the hot tapping application, we’re only welding on the outside of the pipe, so we’re not welding anywhere near the middle of the pipe. 52:08 - How do waterproof arc welding electrodes work? 52:35 - Historical underwater habitation by humans? Dave - Scientists are looking for underwater habitation sites that go back into the early periods of pre-history. There's been extensive work in the North Sea looking for such habitation sites and there's been a colossal amount of work in the Solent off the Isle of Wight. I've done a lot of work looking at a Mesolithic site there. 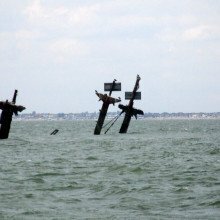 53:18 - Is there a safe way to explore or recover the SS Richard Montgomery? 53:46 - How do whales cope with deep diving? 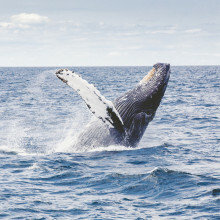 How do whales cope with deep diving? Whales and other deep-divers are generally untroubled by this because they are adapted to remain submerged for extended periods of time, using only the oxygen already present in their bodies. 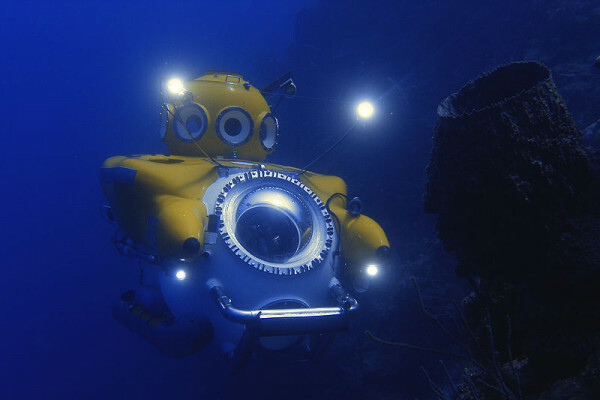 Humans, on the other hand, need to use scuba gear, meaning we end up breathing compressed air, which must be delivered under pressure to compensate for the increased ambient water pressure at depth. Consequently, the increased density of the air consumed by a diver means that significantly more nitrogen dissolves in the blood and tissues. When a whale resurfaces, it generally does so slowly, giving plenty of time for reequilibration and redistribution of the dissolved nitrogen. 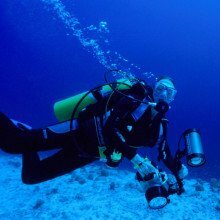 The scuba diver breathing normal air, on the other hand, surfaces relatively rapidly and also carries a much larger dissolved nitrogen load. Beyond a certain depth, this makes the bends inevitable, unless decompression steps are included during surfacing. Also, at higher pressures, the dissolved gases also act as anaesthetic agents, causing nitrogen narcosis, which is why divers going really deep using a helium oxygen mix instead. The other benefit of helium is that it is much lower density than nitrogen, so even under pressure the drag felt by the gas on the airways is reduced. However, eventually a depth - and hence pressure - is reached at which breathing becomes too difficult regardless and this is the limit of human diving endeavours. But free divers - who don't use any supplemental air - can go very deep, just not for very long. So if we were like whales, and adapted to hold onto a breath for hours at a time, we could dive as deep as they can. Unfortunately our biochemistry isn't up to it! 54:10 - QotW - What makes your blood run cold? Why does your blood run cold from fingernails scraping down a school blackboard? QotW - What makes your blood run cold? This week we're wondering what the sensation is when your blood runs cold from fingernails scraping down a school blackboard? The sensation seems to start in the skull and travel down the back and into your spine. So obviously, something to do with nerves but what is happening...? Previous QotW - What makes your blood run cold?